To follow up an earlier post, North Korea’s Kim has finally appeared in public. Or so we’re told. Apparently he was present at some football game at some university blah blah blah…Well, its good to see some leader with a bit o character in existence still, those who dont just bow down to George Bush. Yasser’s gone, they took Sadam – the whole antichrist conspiracy anyone? And China cancelling their affiliations with the United States. Protests over the U.S. supplying weapons worth US$6.5bn to Taiwan, seeing as China still considers Taiwan their territory and their opposition to the US military assistance to Taiwan. Medling, medling and some more medling from the Bush regime. Well he gon be gone soon anyhoo, but what a comic this dude been innit. Gave us all a bit to laugh and cry about. And be sad about as well. 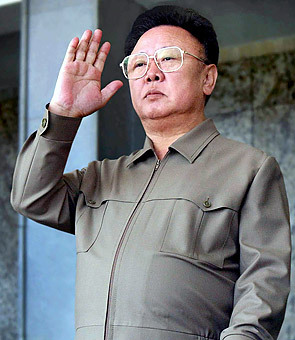 So Kim Jong-il has collapsed. Or is it just another conspiracy (smh). Well according to Song il-ho it is a product of Western media. Oh come on – you cant stay tight lipped on this one. I mean, Kim, missing such an event. He oversees the 50th and 55th anniversaries, to miss the 60th anniversary…Really. And after the meeting held to celebrate the anniversary, whats the released statement “North Korea has an army that will mercilessley punish invaders”. lol Tactics is the way, politics is the game.